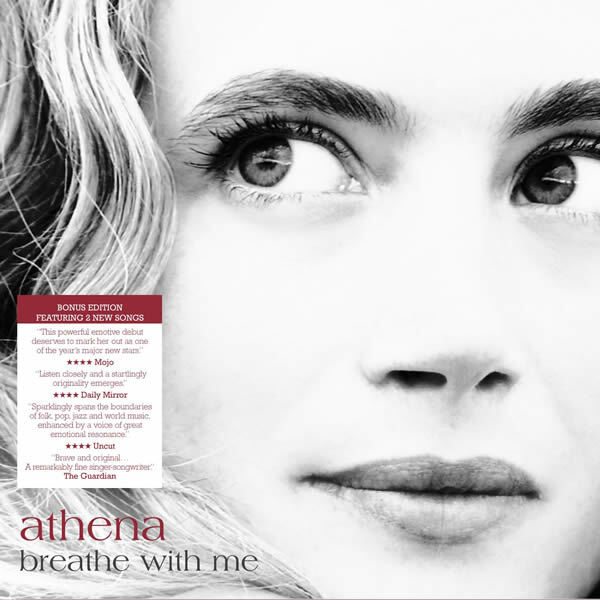 ‘Breathe With Me’ Athena’s debut album Breathe With Me was originally released in 2007. Breathe With Me drew several rave reviews, including the BBC commenting “Just listen to the voice – a fluty, soaring, intimate thing, pure as a Cycladian sky, but with an edge which gives it real emotional eloquence.” Since then Athena has headlined as well as sold out numerous UK tours and performed songs from Breathe With Me as well as her subsequent Peeling Apples when she was road-testing the material during the Breathe With Me tour, including at Glastonbury festival and the Queen Elizabeth Hall at the Southbank in London. ‘Breathe With Me (Bonus Tracks Version)’ In 2008 the album was re-released with two bonus tracks to coincide with the Channel 5 documentary made about Athena (MyMusic) which ended up getting repeats on SkyArts for several years and helped Breathe With Me (Bonus Tracks Version) reach the top 20 UK charts in the Virgin and Amazon UK charts, while famed lyricist Chris Difford (Squeeze) was interviewed on the documentary saying that Athena is an artist who “writes and sings from the heart. She doesn't need to be packaged by anyone; she is simply and beautifully her." Breathe With Me (Bonus Tracks Version) was also released in Greece by SONY. Athena’s song ‘Breathe Again’ from Breathe With Me featured on Concern’s annual TV ad campaign in the UK & Ireland for several consecutive years becoming their theme song. Songs from this record also featured on several well known UK radio shows such as BBC RADIO 3, BBC LONDON, LGR, RESONANCE FM, BBC WORLD and BBC RADIO 4 WOMAN’S HOUR.